Preheat oven to 350 degrees. On a baking sheet, spread pecan halves and toast for 5-7 minutes. Blanch broccoli in boiling water for one minute. Drain and put in ice water for 30 seconds. Drain and cool. 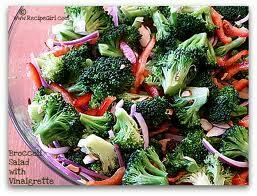 Combine broccoli, onion and red pepper slices. Mix remaining ingredients together for dressing. Just before serving, pour dressing over mixture and toss to coat. Sprinkle pecans on top. This is good without the pecans as well.